I love my parent volunteers! I don’t always have the help, but when I do, it is AMAZING! 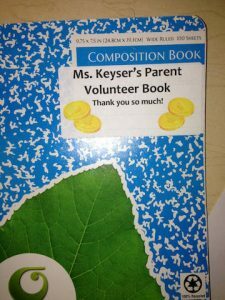 If your parents/grandparents and other volunteers are spending their time to come into your room, it is nice to be ready and organized for them. Most of the time, I find that my parents come into my room while I’m in the middle of teaching. Go figure, I am always teaching and working with my students. Although I would love to stop and take some time to chat with them about what I need done, I don’t want to stop what I am doing with my students. I make sure I have a certain spot in the room for my parents to place their belongings (jacket, purse, etc.) and I have a “To Do” basket labeled with all the supplies that they would need to help. I have two different baskets, one for clerical work (copies, making book, cutting lamination, etc.) 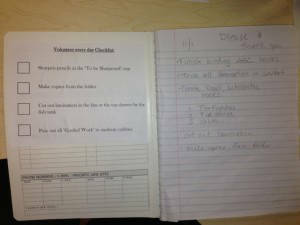 and one basket for students work (small groups, 1 on 1 re-teach). In the clerical, I have things like tape and refills, staples and refills, sticky notes, pens, crayons, markers, paper clips, baggies, index cards, brads, scissors, glue gun and glue, etc. In the student workbasket, I change out the items all the time. 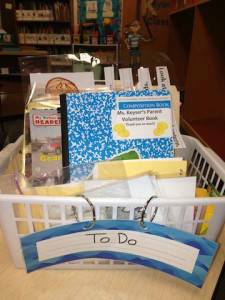 The basket can be for any subject, math, writing, science, social studies, spelling, or reading. In each of the baskets, I have a parent volunteer composition book. On the front, it has a title and in the first front page, I have an everyday volunteer checklist. To access my FREE download of the checklist, please visit my TPT site here. 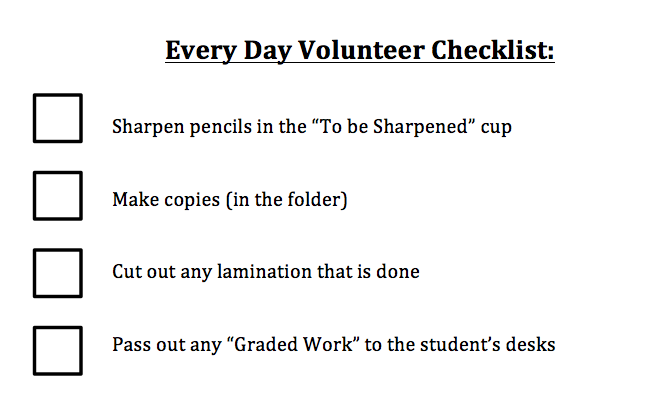 The checklist has things like, pass back papers, cut out lamination and sharpen pencils. 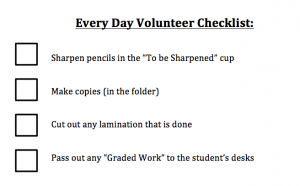 Then I simple write the date at the top of the page and create a personalized checklist with boxes for the volunteer to check off. I always write a quick message thanking them at the bottom of the page as well. Double check that all the supplies the parent will need are ready to go in the basket, that way they can get started right away. When the items get done, I tear out the page and write a new list. I hope this helps you become organized and saves you some time in the long run.